Celebrate winter with a variety of free activities taking place Feb. 14 to 18. New this year, a family skate at The Loop with some of your favourite storybook characters, and a screening of the movie Peter Rabbit at the Scotiabank Theatre. Back by popular demand are a Kitchen Party at the Johnson GEO Centre and Mega Play for children and families at St. Teresa’s Elementary School. 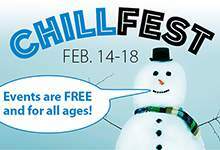 ChillFest has something for everyone and all activities are offered free of charge. Find the complete events listing on the City’s webpages for Events and Festivals or the Calendar of Events, or facebook.com/CityofStJohns/events.